Almost every Internet service, that requires us to identify ourselves, provides a backup identification option. Every properly planned Internet service provides a way to access their services, should we forget our account name and / or password. Some services provide backdoor access in such easy fashion, that some people don't bother about using front door access. Some Blogger blog owners use backdoor access to Blogger, routinely. This is a problem, in several ways. Blogger has promised us that our blogs will be ours forever - but there are limitations to this promise. We may publish blogs anonymously, with no minimum activity requirements. If we wish, we may publish our blogs anonymously. We can update a blog once every 10 years, or daily - and both activity levels are equally valid (though the latter is a better choice, if we care about reader count / search reputation / making money). Even with once in 10 years being a valid activity level, it is in Blogger best interest to encourage more frequent activity. People who update a blog daily are more likely to maintain access, reliably. Blogger protects our blogs by tying them to our Blogger accounts. 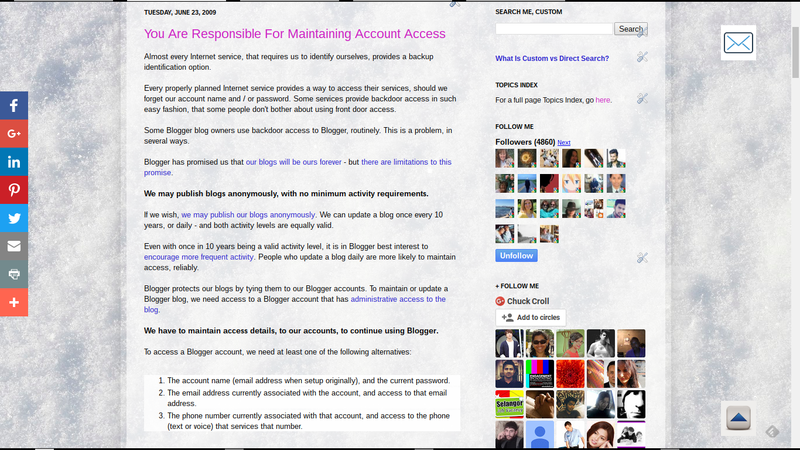 To maintain or update a Blogger blog, we need access to a Blogger account that has administrative access to the blog. 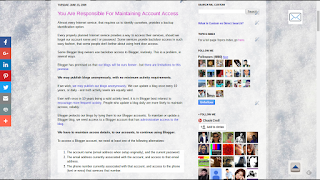 We have to maintain access details, to our accounts, to continue using Blogger. The account name (email address when setup originally), and the current password. The email address currently associated with the account, and access to that email address. The phone number currently associated with that account, and access to the phone (text or voice) that services that number. Normal access to a Blogger account uses the account name, and the password. If we forget either the account name or the password, we need backdoor access to the account. Backdoor access uses the email account, or a pre registered telephone number, currently associated with the Blogger account. When a password reset on the account is needed, a reset message is sent to the correct email account, or to the phone number. To get the password reset message, we have to have access to the backdoor email account (using an email message), or to the phone number (using a text or voice message). Infrequent use, or varying browser / computer / location, requires more details. Note that, depending upon how often or regularly you access Blogger - or from what computer in what location - you may be required to provide some demographic details about yourself. This may include your use of Blogger / Google service, or various account details - when you try to use any backdoor access to your blog. This is not Blogger being capricious or petty - it is Blogger protecting your account. We must maintain and retain some authentication details. We have to maintain access to the Blogger account, if we are going to have a blog. If the backdoor email account or phone number is discontinued, it is our responsibility to remember the Blogger account name and password. Having remembered account name / password, we change the backdoor email address for the Blogger account to our current working email address, before we forget the Blogger account name or password. It's also our responsibility for ensuring that any non GMail email address, that's used in our account, is accessible and valid. We have to help Blogger, to help keep our accounts and blogs safe. Ignore any lack of activity on our part. Support our decision to use multiple Blogger / Google accounts. Blogger provides front door, and back door, access to our Blogger accounts, and expects us to maintain either, or both, accesses reliably. There is no other access provided. Blogger / Google does not have a staff who examines faxed copies of drivers licenses, passports or birth certificates, to provide a second back door to our accounts. We have to start with a valid backdoor access, and we have to maintain that backdoor, reliably. Blogger TOS states a requirement, that we maintain access. Blogger Terms Of Service even state this as a requirement - though wording has changed. Historical or current - the message is the same. Blogger cannot provide ad hoc third level account access options. We have to maintain our own access to our Blogger accounts. When a Blogger employee is spending time validating someone's birth certificate, that's time that some other anxious and worthy blogger has to spend waiting for his / her blog to be unlocked, custom domain to be reset, or another Blogger wildfire to be diagnosed. 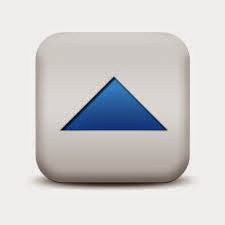 Blogger / Google has to make good business decisions, and maintain Blogger to support the many people who use Blogger properly - while resisting the demands of the people who use Blogger improperly, and the suggestions of those who try to use Blogger maliciously. Too many #Blogger blog owners change email addresses, or get a new phone - then remember that the email account or phone just discontinued was vital in logging into their Blogger account. This is a problem, because they never bothered to remember the Blogger account name and / or password - and control of their blog is now lost. Google bought out Blogger and they bought out the dial up ISP where I had my email account when I started blogging. I remember when the ISP converted to gmail three or four years ago because I had to drop the part of my e-mail address that identified the country where I reside. Doing so set up a conflict between the original e-mail address that still worked up until a week or two ago and the Blogger (gmail) user name associated with that original email address. This is a mess. I don't know if I'm ever going to be able to access the email account that was converted to gmail with a name modification. I also don't know if I'm ever going to be able to sign in on my Blogger account using my primary broadband ISP. All I get is a Data Transfer Interrupted page that refers me to my broadband ISP. I called them and they checked. They can access my Sign In page and if I gave them the password along with the new gmail user name, they could post on my blog. But they can't explain why I get Data Transfer Interrupted and they don't. They said I'd have to take that up with Blogger or Google and I would if I could contact them on my broadband account, but I can't. So I'm contacting Blogger and Google via WiFi. I've got a twenty pound brick chained to my bumper and I won't get my blog back until after the tow truck has finished impounding it. Google bought out Blogger and they bought out the dial up ISP where I had my email account when I started blogging. That's an interesting tale. This would be very good to explore in detail, in BHF: Something Is Broken. I realize that blogger can't just give away account info willingly....But what do they do when someone posts copy written materials? They must have some sort of method for resolving disputes when people post content they do not own.